The Hemingway modern chrome finish 5 arm semi flush LED light has five slender twisted design arms laden with warm white LED lamps. Attached to a ventillated flush mount, this non-dimmable energy efficient show stopping fitting is bound to attract attention. Perfect lighting for rooms with low ceilings. 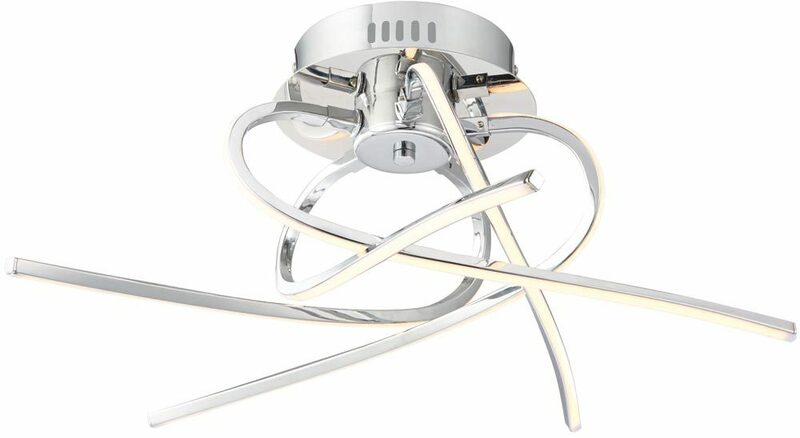 This fitting has five twisted slender arms that snake below the ceiling mount. One face is finished in chrome and the other has a frosted acrylic diffuser strip that house the LED’s. Each arm is twisted in such a way that light is given off in all directions to illuminate the whole room. The non-dimmable, non-replaceable warm white (3000k) LED strips give a total lighting output of 1250 lumen.